Hi, I am interested in your 1980 Chevrolet Corvette listed on Autotrader for $21,000. I'd like to get more information about this vehicle and confirm its availability. 1985 Tune Port 350 Corvette engine, Ecklers Wide Body kit, 20,000 miles on dash (title is exempt for mileage), red leather interior, power steering, power brakes, power windows, A/C, alloy wheels, AM/FM/Cassette radio, rear window defogger, tilt and tele steering column, dual sport mirrors, glass T-tops, dual exhaust, and much more. This vette had the same owner for the last 7 years and his grand father owned it for 10 years before that. This car is a blast to drive and is very quite unique, with an Eckler wide body kit. Eckler wide body kits look awesome and are very hard to find. We changed the oil and filter, transmission filter and gasket, rear end grease and additive, and checked and lubed the suspension. We replaced the upper and lower control arm bushings, upper and lower ball joints, idler arm, tongue bushing, leaf spring bushings, radiator, upper and lower radiator hoses, computer, map sensor, throttle position sensor, wiper motor, front gas shocks, and much more. We also had the corvette repainted in base-coat/clear-coat, and installed a new carpet set plus new seat covers. 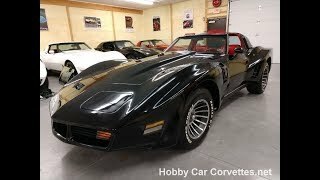 GM only released 5,069 with the L82 engine option, and 7,250 black Corvettes in 1980 out of over 40,000 produced. 1980 was the last year for the L82 engine option.